Our bladder bags are custom manufactured to be utilized in rolloff containers, vacuum boxes, dump trailers, rail gondolas, and lugger boxes to contain specialized dry or wet waste streams. 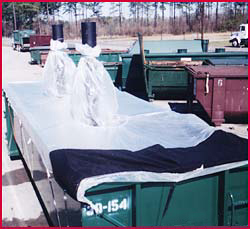 High-strength material options such as woven polypropylene, woven polyethylene, and high heat fabrics are available to give our customers a specialized alternative to standard dumpster liners and dump truck liners. Custom requests such as venting features and inner barrier polyethylene liners are available as well.